CHESTNUT HILL — The No. 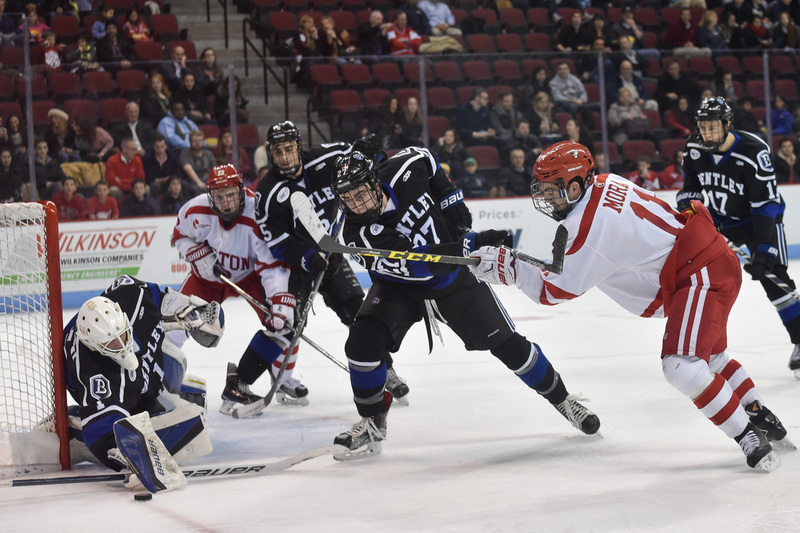 5 Boston University men’s hockey team left Conte Forum Friday evening with a 5-3 comeback win over No. 3 Boston College. 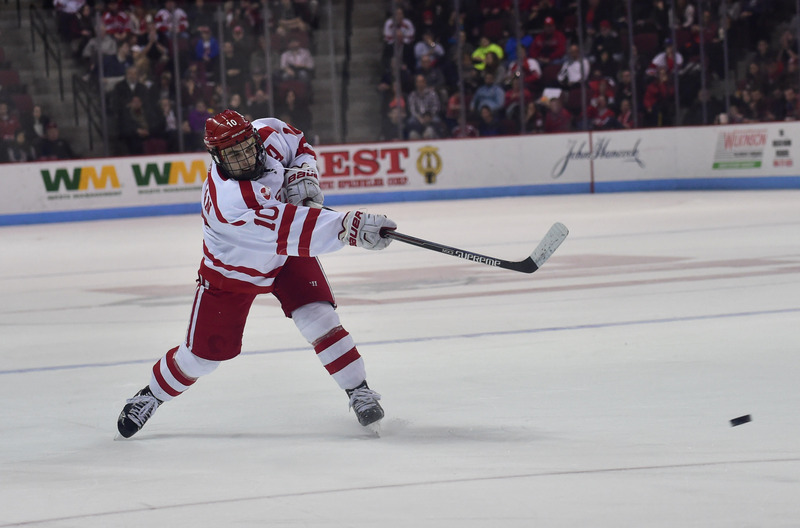 Junior forward Mike Moran, freshman forward Jack Eichel, senior assistant captain Evan Rodrigues and freshman forward Nikolas Olsson all notched third-period goals for the Terriers (5-1-0, 3-1-0 Hockey East). Rodrigues only had five goals all of last season, but BU head coach David Quinn doesn’t think that speaks to the season Rodrigues had in 2013-14. Quinn noted in his postgame press conference that “people just look statistically” at Rodrigues’ junior season, without taking into account the impact he had on the team in other areas. In 2014-15, Rodrigues is starting to take charge statistically as well. 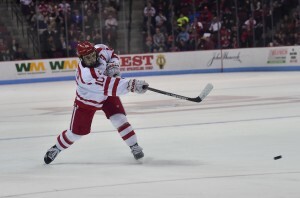 Against BC on Friday, Rodrigues moved up to the first line after junior forward Ahti Oksanen left following a collision in the first period. 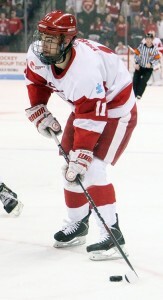 Rodrigues handled the task marvelously, notching two goals to boost his season total to three. “This kid’s a great player. This kid does everything. He competes, he’s a great penalty killer, he’s a great power-play player,” Quinn said. “He’s a very good hockey player and he’s underrated. He’s a great teammate and I’m lucky to have him, I’ll tell you that. There’s nothing he can’t do out here at this level. He plays defense at times in practice and takes 1-on-1s as well as anybody. Quinn talked about the resilience and maturity of his team to battle back from deficits three times, and pointed to the team’s resolve in the third period. He said he was particularly proud of freshman defenseman Brandon Hickey, who gave up a crucial turnover en route to a BC shorthanded goal to give the Eagles a 3-2 lead just more than six minutes into the third period. However, Hickey was able to maintain composure, and he even provided assists on the next two BU goals. “I couldn’t be happier for Brandon Hickey, tough turnover there on the shorthanded goal — really could have deflated us — but I thought our team responded well,” Quinn said. BU’s ability to keep the score close despite some adversity also played a factor, according to Quinn. “The fact that we never got down two allowed us to continue to stay in the game and feel good about ourselves,” he said. How many times have we said it this season? The Terriers had yet another offense-heavy third period, boosting their third-period scoring to a 14-1 margin through six games this season. 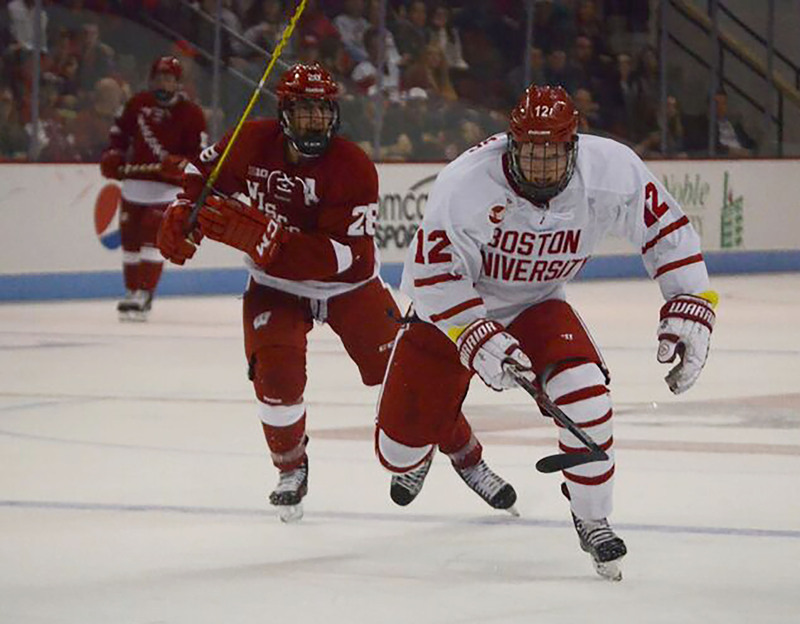 Andrew has more on BU’s stellar final frame in his sidebar. Also in the “stop us if you’ve heard this before” category, BU suffered yet another slow start. In Friday’s game, BU got just seven shots on goal to start the frame. BU has been outscored 3-2 in the first period this season. Friday night was the second consecutive game in which the Terriers could only muster a single-digit shot total, as BU only tallied five shots in the first period against Providence College last Saturday. “For them, coming off their loss on Wednesday [against the University of Connecticut, 1-0], you knew they were going to come out flying,” Rodrigues said. “I think they took it to us a little bit in the first period and it’s a big game, a lot of young guys on our team and with that crowd, you’re not going to play the way you usually play, and sometimes you have some jitters, some emotions. BU got a tad sloppy at the 6:05 mark of the third period, when it gave up a shorthanded goal to BC forward Ryan Fitzgerald for his second goal of the game. The goal came on the aforementioned turnover from Hickey. 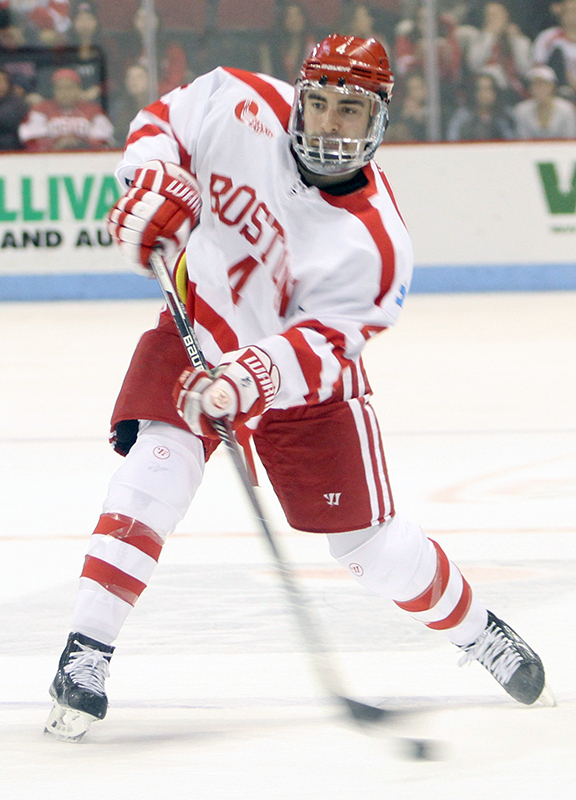 It was BU’s first shorthanded goal allowed this season. 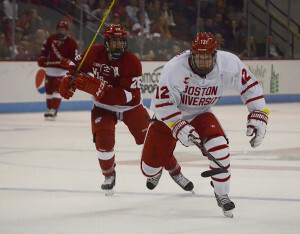 It proved irrelevant later, though, as BU stormed back with three more goals to tie and take an eventual two-goal lead. We didn’t see the collision itself from our vantage point — which was an understandably very crowded Conte Forum press box — but Oksanen missed the majority of the game after crashing into a BC defender. Quinn said it was “too early to tell” Oksanen’s status.